Senator John McCain, R-Arizona, has been diagnosed with a cancerous brain tumor, according to a statement released by his family and the Phoenix Mayo Clinic. The statement says that following a procedure to remove a blood clot the diagnosis was revealed. 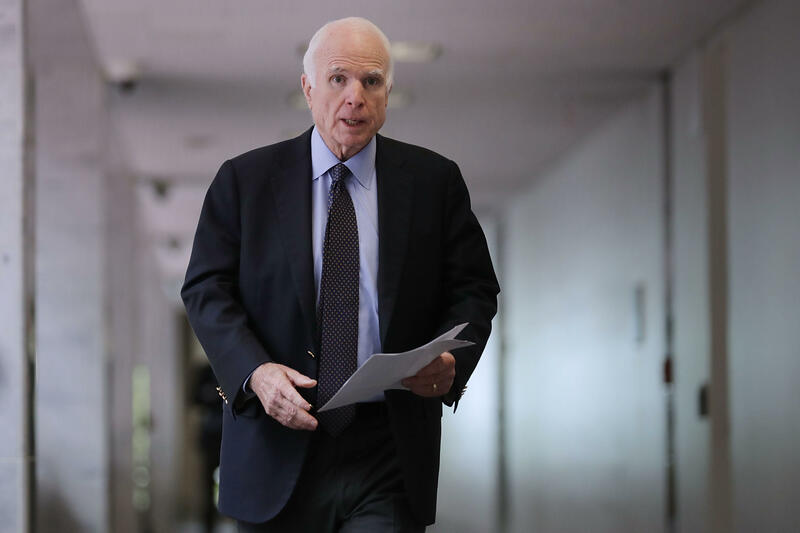 "On Friday, July 14, Sen. John McCain underwent a procedure to remove a blood clot from above his left eye at Mayo Clinic Hospital in Phoenix," the statement read. "Subsequent tissue pathology revealed that a primary brain tumor known as a glioblastoma was associated with the blood clot." What is glioblastoma, the brain cancer John McCain has been diagnosed with? The statement also added that the 80-year-old senator and his family are reviewing further treatment options. "Treatment options may include a combination of chemotherapy and radiation," it added. "The Senator's doctors say he is recovering from his surgery 'amazingly well' and his underlying health is excellent." Meanwhile, McCain's office released a statement in wake of the recent revelation. "Senator McCain appreciates the outpouring of support he has received over the last few days. He is in good spirits as he continues to recover at home with his family in Arizona. He is grateful to the doctors and staff at Mayo Clinic for their outstanding care, and is confident that any future treatment will be effective. Further consultations with Senator McCain's Mayo Clinic care team will indicate when he will return to the United States Senate." Late Wednesday, McCain's daughter Meghan released a statement on social media saying "the news of my father's illness has affected every one of us in the McCain family." She goes on to write that her father is "the toughest person I know" and that her love for her father is boundless. "My fears for him are overwhelmed by one thing above all: gratitude for our years together, and the years still to come," Meghan wrote. "He is my strength, my example, my refuge, my confidante, my teacher, my rock, my hero -- my dad." CBS News' chief medical correspondent Dr. Jon LaPook spoke with CBSN on Wednesday night and said that McCain and his family are in for a battle. "We're all hoping for the best for him and I would caution against trying to make any prognosis and statistics because everyone is different," LaPook said. "A glioblastoma is a primary brain tumor which means it starts in the brain -- it didn't spread there from somewhere else -- and it's a very serious type of brain tumor and even though they have removed it so far as imaging ... the fear is that microscopic cells still remain and that's why they're [doctors] talking about further treatment." Colleagues began to send in their well-wishes about Sen. McCain, including President Trump who issued a statement saying that McCain "has always been a fighter" and that he and Mrs. Trump "send our thoughts and prayers to Senator John McCain, Cindy, and their entire family," adding, "Get well soon." Former President Barack Obama wrote on Twitter that "cancer doesn't know what it's up against. Give it hell, John." On Friday, McCain's surgeons performed a "minimally invasive craniotomy" -- an incision through the skull -- to remove a "5-cm blood clot" above his left eye, according to a statement from McCain's office. This was not far from the spot on his left temple where he had a cancerous lesion removed in 2000. "I was in a battle with melanoma," McCain said at the time. "And I know, and I know somewhat, at least to a small degree, how tough that battle can be." Sen. Graham had noted that the normally sharp six-term senator had become forgetful lately. Most notably, McCain faltered publicly while grilling former FBI head James Comey last month in front of the Senate Intelligence Committee.